Does referral marketing make sense in the solar energy industry? A report from the Solar Energy Industries Association recently revealed that the cumulative number of solar installations in the United States had eclipsed 1 million for the first time. During that span, solar power accounted for 64% of all new electric generating capacity in the United States. Simply put, solar energy is on the verge of going mainstream. 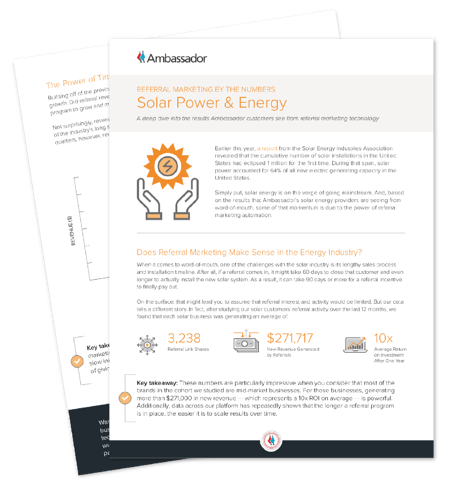 And, based on the results that Ambassador’s solar energy providers are seeing from word-of-mouth, some of that momentum is due to the power of referral marketing automation. Just take a look at some of the results from industry leaders we work with in our latest report.